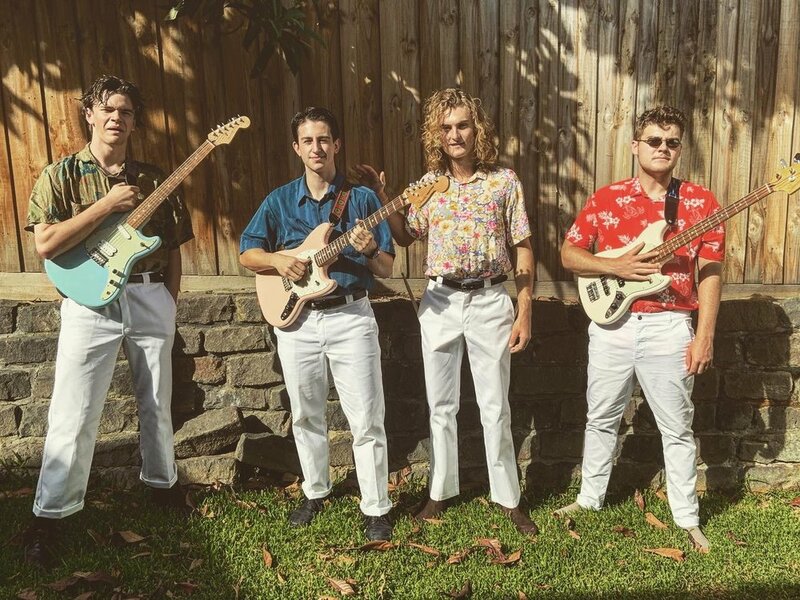 Catchy melodies in the style of ‘60s and ‘70s pop and rock-inspired tracks have been floating across the airwaves of Triple J by band members Jordan, Connor, Angus and Vincent, who combine to form local band Teenage Dads. But it’s not what you’re thinking. Their baby is actually their band and their child is bringing home A+ report cards. This quad-psych-pop band has tracks with blasting synths and lyrics that will have you singing along as the good vibes flow. On stage the band oozes charisma with immense energy and a high sense of fun. Performing alongside Kingswood, Northeast Party House, Ruby Fields, Radio Moscow (US) and Wharves have been career highlights for the Mount Eliza Secondary College alumni. Having formed the band during high school in 2016, they progressed quickly from jamming in the school music rooms to playing at friends’ parties throughout their final school year, and then venturing on to venues in 2017. With Vincent on drums, Angus on bass, Connor on guitar and Jordan on synth and vocals, these young artists are proudly self-taught and never turn down the chance for a jam session. Having gained experience playing covers, they entered 2017 writing and performing their own original songs — cue lyrical genius Jordan regularly messaging his band mates at 4am when his writing inspiration hit — and it snowballed from there. The year saw the Dads offered the chance to play all around Melbourne supporting other local artists before finding themselves presented with the opportunity for their own debut headlining show in December 2017. In the lead-up to their headline show, September saw the release of their very first EP, Wett Weather. These fresh new tracks, straight out of Jordan’s shed-turned-recording studio, found their way on to Triple J Unearthed. To put their following achievement into perspective for you, it goes that anyone can upload their music tracks to the website and Triple J then listen to them all and play their favourites on the Triple J Unearthed station. Teenage Dads’ energetic debut EP graced the radio waves shortly after its release. And just like that they were getting the recognition they deserved. Just a year later, their gigs are sold out for their current tour — next stop Tasmania! Letting us in on their insider statistics from Spotify, Vincent told us they have 11,000 monthly listeners and currently more than 200,000 plays on Spotify, including listeners from all around the globe — what an achievement! Their music appeals to all age groups, and seeing the demand from underage fans for an all-ages concert, Vincent took it upon himself to get it happening by launching Pack Up Time. Held at the Mechanics Hall in Frankston, the event was pumping on Saturday, March 23. A line-up of local bands and musically gifted friends joined fellow host 123 Agency with support from RRP Radio. Collectively, they put on a highly successful community event to be envied by all.